Under Florida law, when someone falls down and gets hurt at a business establishment (a “slip and fall” or a “trip and fall”) the victim may have a claim against the owner or operator of the store or restaurant (or work site). Under Florida’s “premises liability” law, these establishments can be held legally responsible for paying the victim’s damages (pain and suffering, lost wages, physical therapy, medical bills, etc.) if they are found to have been negligent, including failing to take adequate precautions to protect their guests and other invitees. Usually, business establishments have liability insurance to cover these claims. When a claim is made with an insurer, the victim’s demand will likely be handled by an insurance adjuster or an attorney hired by the insurance company. These agents of the insurance company are usually very experienced in how to handle a plaintiffs’ claims. It’s what they do all the time. These agents are tasked with trying to keep any settlement as low as they can. They may even try and deny the claim outright, if they think they can get away with it. One basis for denying a claim, or making a low offer, is by asserting the legal defense of “comparative negligence.” Florida Statute 768.81 is a law that limits the amount of recovery for an injury victim if he or she is partly to blame for the slip and fall. As a “comparative negligence state,” Florida allows a victim’s jury award to be offset by the percentage of responsibility attributed to the victim in most accident and negligence cases. For instance, if there is a car crash and the injured driver is considered 20% responsible for the accident, then his total damage recovery will be 80% (100 – 20). 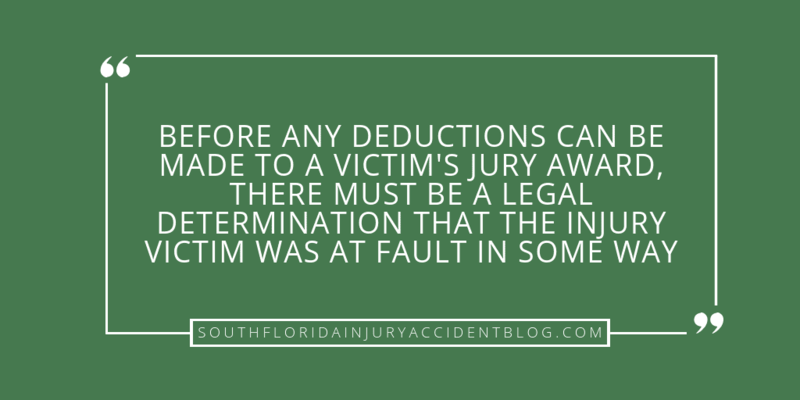 However, before any deductions can be made to a victim’s jury award, there must be a legal determination that the injury victim was at fault in some way. Absent proof that the person who was hurt was partially responsible for his or her injuries, the “comparative negligence” deduction cannot be used by the defendant and the full amount of the claim must be paid. Jennifer’s story began when she decided to wear some very fashionable high-heeled shoes to work one morning. Her shoes, like many pairs that women were wearing at the time, had four to five inch high heels. Jennifer worked in an office building that was owned by Americorp. During a work break, Jennifer entered a third floor restroom in the Americorp building and slipped on an “unusually slippery floor.” She fell down and was hurt. Jennifer filed an injury claim for her slip and fall accident and Americorp refused to pay it. So she sued them for negligence, arguing that legally her injuries were a direct and proximate result of Americorp’s negligence and under Florida premises liability law, they were legally responsible for covering the damages that she suffered as a result. Americorp fought the claim in court, and among their reasons why they should not have to pay her claim was the argument of “comparative negligence” because while fashionable, Jennifer was (they argued) partly to blame for what happened because of her footwear. The trial judge did what some call “splitting the baby” — he ruled each party was 50% negligent. Refusing to give up, Jennifer appealed her case to the reviewing court. They agreed with her. The Court of Appeals determined that there was absolutely no evidence that Jennifer’s high heels contributed to her fall in the restroom. While the defense lawyer argued that she had “assumed the risk” by wearing 4 to 5 inch heels, that wasn’t enough. Bongiorno citing Curd v. Mosaic Fertilizer, LLC, 39 So. 3d 1216, 1227 (Fla. 2010). In the case, Americorp failed to prove that Jennifer Bongiorno had a duty of reasonable care NOT to wear high heels to work. There was no evidence that Jennifer Bongiorno could have anticipated she might slip and fall at work when she choose to put on those fashionable high heels that morning. Does This Case Effect The Comparative Negligence Defense? In the future, plaintiffs will be able to point to Jennifer’s appellate win in court when insurance adjusters or defense attorneys start arguing that the victim’s shoes caused their accident. However, each premises liability accident is unique to its circumstances and determining liability and the possible defense of comparative negligence is something that needs to be considered on a case by case basis. Jennifer’s case does not mean that high heels are automatically exempt from a comparative negligence challenge. A good piece of advice if you have been harmed by a slip and fall, is to at least speak with an experienced personal injury lawyer before you file a claim to learn about some of the issues that can arise with these claims, including the type of evidence needed to prove a claim and the type and amount of damages you can recover. Most personal injury lawyers, like Alan Sackrin, will offer a free initial consultation (over the phone or in person) to answer your questions. How do the shoes I am wearing affect a slip and fall?